Sure, they are designed to keep rain runoff away from your house, but gutters can be used in so many other creative and useful ways. Spring is a great time of year to clean the accumulated debris from your gutters—and perhaps even replace gutters that have seen better days. So, what can you do with old gutters or the remants from a new installation? Put them to practical and creative DIY use, of course! Here are five smart rain gutter projects that may surprise you. 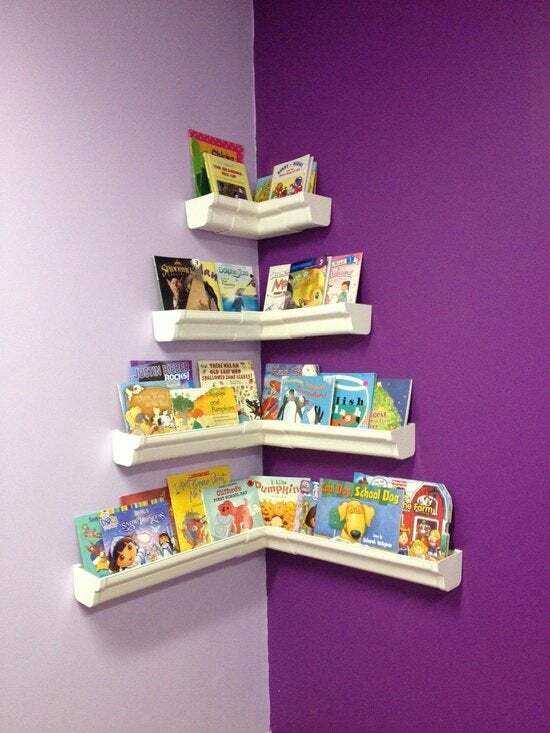 Whether you are designing a new nursery or carving out a quiet space for your toddler’s story time, rain gutter shelving is ideal for over-sized books. Be sure to mount gutters securely to the wall and at a height that your kids can reach easily. There’s no need to bring the cooler to the table when it’s already built in. 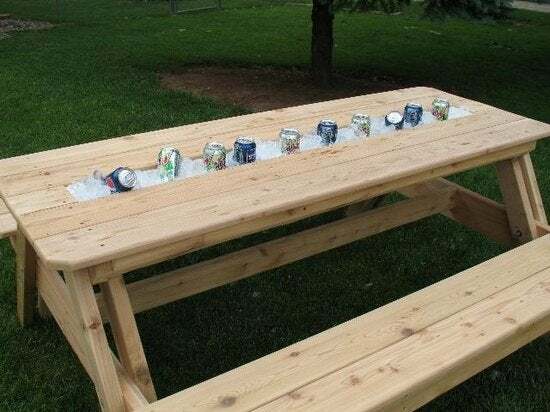 This rain gutter ice caddy was made by removing most of the center slat of a picnic table and replacing it with a gutter of the same dimensions. Check out the great step-by-step at Redesign Revolution. Gutters with end caps can be used to make suspended planters inside or outside of the home. 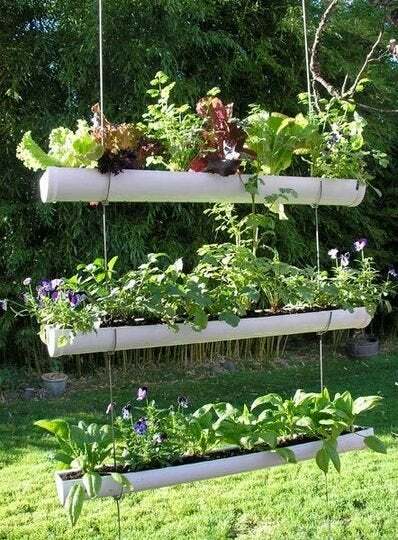 Simply cut the gutters to size, drill holes on both ends, and thread chain or tension wire through to create a hanging gutter garden. If you’re suspending the planter outdoors, locate it near a sprinkler or hose for easy maintenance. Farm animals are typically fed from a trough, and what is a gutter but a roof-mounted trough? Brought down to earth, a gutter’s perfect for this chicken buffet. Just cut a length of gutter to size and mount it on leftover wood. 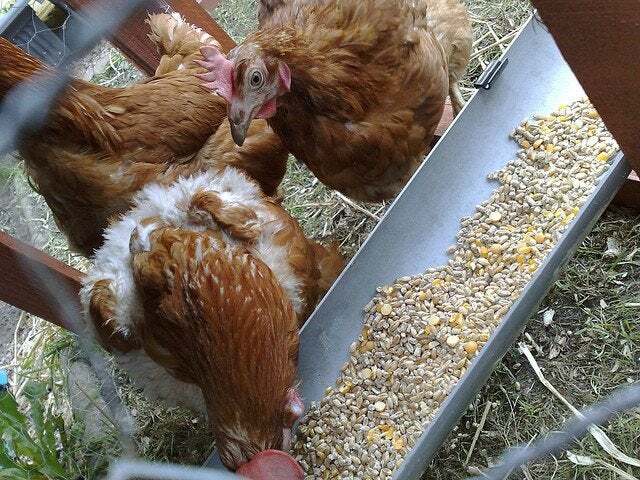 Be sure to get the height right so the chickens don’t have to jump for their breakfast. One of the biggest challenges for crafters is figuring out where to stash all the supplies and materials. This gutter-turned-ribbon dispenser is a clever solution. 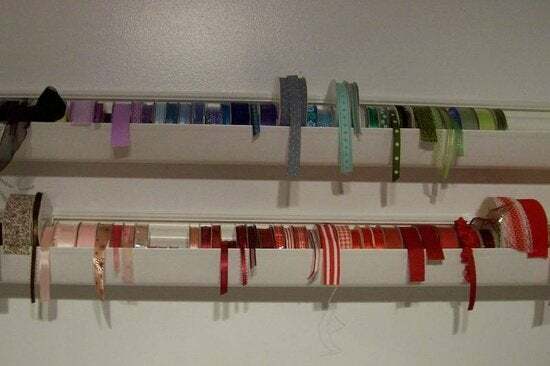 Attach a length of gutter to the inside of a cupboard or above a worktable to keep ribbons organized and readily available.